If your like us, you've spent hours researching the cost to get your HD or SD feature transferred to 35mm film stock, only to find that it will cost you anywhere from $25,000 to $30,000 to output an average 90 minute film. We think that's way too expensive... period. We couldn't accept that it could cost so much to output features to 35mm film, so we set out to find a more cost effective solution, and you know what we found? The actual cost to output a feature length movie, including Kodak negative film stock, maintenence costs for the equipment, wages for someone to run the system, lab fees for processing the film and the fee to strike a print, total less than $15,000 dollars complete. Where does the extra $10,000 to $15,000 go? Directly into the profit column of the company's balance sheet, which got us thinking... why not just buy the equipment and do it ourselves? The Problem with the 'do it yourself' method. You've probably had the same thought, and if you did any research, you know it's simply a matter of cost. The equipment is very expensive. And that's expensive with a capital E.
A single high quality film output machine costs betwen $165,000 and $400,000 depending on it's output speed and optional 'extras', and that's just not feasible for a small independent film producer to justify. We couldn't be the only ones looking for a better solution. There must be other independent filmmakers trying to accomplish the same thing. And since you're reading this right now, I'm willing to bet you're one of them. We realized that if we could leverage the power of a small group of independent filmmakers, and find the right piece of equipment, provided by a manufacturer that would provide training and support, we could provide the most cost effective high quality film transfer option anywhere. 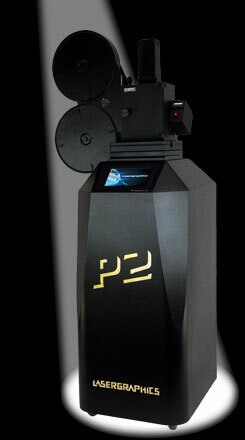 This Producer Series output units are the most cost effective, yet expandable film output units available on the market. They are manufacturerd by Lasergraphics and have been used to output DI for numerous major motion pictures. I spent a great deal of time on the phone with the executives of the company to find a feasible way to bring high quality film output to low budget independent filmmakers, and after weeks of negotiations, we were able to come up with a way to make it happen. Effective immediately, we will begin taking pre-orders for the filmout of 50 feature length films at the guaranteed rate of $0.10 per frame. This will include raw stock, lab fees, and one positive print. If you don't need a positive print, we will discount the job accordingly. You will not need to send any money now to guarantee this rate. We do ask, however, that you only sign up for the program if you are financially able to afford to output your film at our discounted rate. If you are uncertain, we will be happy to give you an exact quote based on the length of your film. If you are one of the first 50 filmmakers who sign up for the program, you will be considered a "charter" member, which will guarantee you lifetime film outputs at the discounted rate. The cost will only increase if the cost of raw stock or lab fees increases. Once we have obtained commitments for 50 feature film projects, Lasergraphics will provide us with a Producer 2 unit, including delivery, setup and training and will work with our staff to provide the highest quality output for each of our 50 charter projects. At this point we will begin collecting a 30% deposit for each project. This will guarantee your place in line. You film will be assigned the first available position upon receipt of your deposit. Once the initial charter projects have been completed, Q Station will begin to offer film output services to all filmmakers at a slightly higher rate. Based on today's material and lab costs, we anticipate offering this service to the general public at a rate of $0.14 per frame. Interested in seeing your movie on 35mm film? E-mail Greg Steiner at gsteiner@q-station.com with any questions you may have, or to sign up for our program.